When enhancing the appearance of your fireplace, most people think of the mantel first. Although many people refer to the area above and to the sides of the fireplace as the mantel, the area on the sides is actually called the “surround”. When you choose a one-piece option, your mantel and surround are built together, so they may be referred to by either term. There are some things to consider when customizing a fireplace surround. You can either have your surround custom-made from the beginning by your mantel provider or you can customize your surround at home through the use of decorations. If you frequently change your decor, you may want to select a surround with neutral features and do the decorating yourself. That way you can change the appearance for holidays or with the changing seasons. You can have mounting hardware professionally installed to hang various items without damaging your new fireplace mantel or surround. If your decor generally remains the same and you wish your mantel to make a statement on its own, you may wish to have a surround that is custom-built for you at the source. 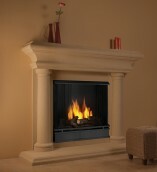 At SoCal Fireplace Mantels, we can help you with a custom fireplace surround in Orange County. You can work with our design expert to create a fireplace surround that fits in with your exact specifications, including material, texture, patterns, colors, and design features. In this way, your new surround will be just what you are looking for.